Minicassette is specifically designed to cope faultlessly with the rigorous stop-and-start demands of dictation recording and transcribing. Clip firmly attaches to file folders for convenient storage. 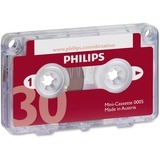 Minicassette offers a 30-minute capacity.